Too many cooks? Not for this kitchen design! It’s an impressive lesson in teamwork and collaboration, with Tamara Raymond Hermann of Crown Point Cabinetry, Josh Sundstrom of WillowRidge Construction, William Merriman of William Merriman Architects, and the homeowners, all contributing to the look and feel of the space. How did they work together? 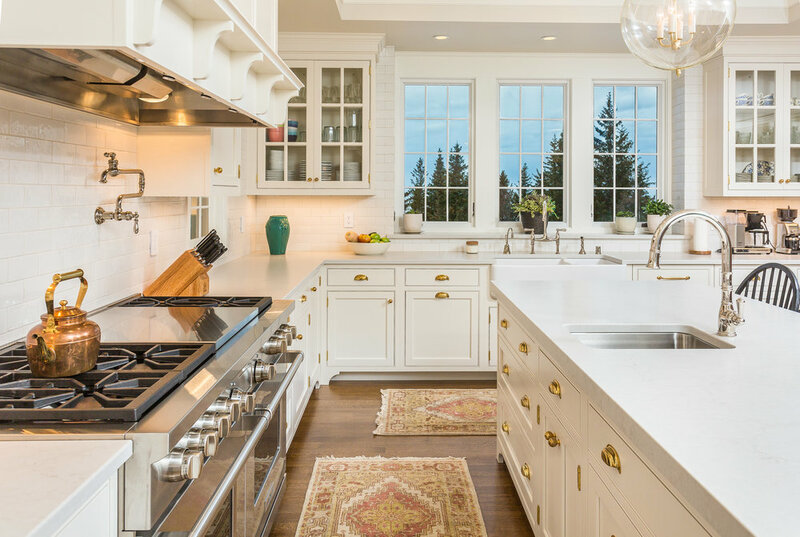 For this new build designed in the style of a traditional Alaskan farmhouse, the homeowners wanted a beautiful kitchen space that would also be functional for their large family. Aesthetically, they were looking for a classic, subtle design – something bright and cheery during the dark winter months – with cabinets that really felt like furniture. To accomplish this, they went with a mostly all-white palette – cabinets, backsplash, island – contrasted with black island seating, stainless steel appliances, and unlacquered brass hardware. The center of the ceiling is raised, highlighting decorative beams, then lowers at the perimeter to both connect the cabinetry vertically and provide harmonious lines echoed in the island, hood and trim. Recessed ceiling lights add to the brightness while blending into the background, and the large, clear globe lights over the island provide a touch of muted elegance without drawing attention. Functionally, they wanted dedicated space for their particular needs (lots of food storage and room for baking) and efficiency built into the design. Creating that dedicated space meant designing for a walk-in pantry and Crown Point Cabinetry creating a custom "baking larder" that looks like a standalone piece of furniture to hold all baking ingredients, dishes, and tools. Making the kitchen efficient meant planning two well-thought-out working triangles – one with the dishwasher, the large farm sink, and cabinets with everyday dishes, and another with the range, refrigerator, and the island in close proximity for cooking and prep work. The end result is a timeless kitchen that will remain beautiful and useful for decades to come. How do you update the kitchen in one of the oldest homes in Anchorage? A space that, by modern standards, is small, dark, and poorly laid out? A house that the client’s family has had for generations? These are the questions that designer Fernanda Conrad found herself facing when she was contacted for the job that ultimately became our Grand Prize winner. Thankfully, the clients themselves were, in Conrad’s words, “kind and easygoing.” They just wanted a light, open concept kitchen that felt modern… without discounting the history of the home. How did Conrad achieve that? After talking to the client, she decided to go for a mid-century modern look that incorporated their favorite color: teal. Not surprisingly, the biggest obstacle was designing within the confines of a generations-old structure. Conrad got around this – and opened up the space – by vaulting the ceiling and painting the supporting structures white. Combined with the sleek Durasupreme Paintable White and Storm Gray cabinets, the light Cambria Quartz countertops, nearly invisible can lighting, and windows that were strategically placed to let in as much natural light as possible, it helps create a kitchen that feels bright, airy, and spacious. The teal doesn’t hurt either! To get the clients’ favorite color into the design, they opted to use that color for the tile splash (Fireclay Tile). It really makes the wall pop, but without taking over the room. The teal shabby-chic teal bar stools, too, are a nice touch that draws the eye at the bottom of the room. Also helpful was the decision to extend the original natural oak flooring into the new kitchen. The wood not only warms and softens the stark white cabinetry, but also marries the kitchen and living area seamlessly, making it feel bigger than it really is. Additional kitchen features of note include the vertical lift doors on the wall cabinetry, glass inserts, and a floating shelf to display the client's favorite dishes and add some splashes of color. The appliances, which are all Thermador, fade into the background intentionally and were chosen based on what fit into the design. Because of this, they provide a sense of utilitarian strength and elegance that melds with the aesthetic of the kitchen to form a seamless whole. The end result is a kitchen that seems like it’s floating on clouds. Pretty impressive for one of the oldest homes in Anchorage. When Valerie Rizzo was brought in to remodel this kitchen, the clients’ needs were fairly specific: they wanted the space to feel lighter, to reconfigure the island, and to add room for a new 36” range where their pantry was at the time. With limited room in the main kitchen area itself, Rizzo decided to relocate the pantry entirely, putting it behind the range in the hallway. Doing this allowed her to make it a spacious, custom walk-in, and she was able to make it feel like it was still part of the kitchen by designing matching hall and dining room cabinets (even the granite is the same). She also added an under-counter refrigerator and wine refrigerator in the adjacent dining room. The kitchen itself has a cool, cozy, comfortable feeling courtesy of the way the Pumice-stain cabinets from Omega Cabinetry mesh with the Delirium Granite countertops from Alaska Marble & Granite, the stainless steel appliances (including the attention-getting range and hood from Wolf), and the pendant lights over the island. Rizzo turned the gorgeous stainless steel backsplash designed by the homeowners into a focal point by installing it on the wall above the range. But there’s plenty of warmth here, too. The existing Brazilian Cherry flooring was refinished and added to adjacent rooms to tie everything together. Mounting the sinks below the granite creates the homey illusion of a farm sink. And the reconfigured island offers plenty of room for entertaining while cooking without dominating the room. Rizzo was even able to turn the one real obstacle into a plus. Since she couldn’t move the column present in one corner, she decided to incorporate it into the design, creating a detail for the raised bar top which flanks the column on each side. The result is that the lackluster column was transformed into a welcome aesthetic detail that gives the space character and makes it more interesting. In terms of functionality, the design offers counter space everywhere and plenty of room for movement. Including both a 48” sink along one wall as well as the 24” sink at the island means you never have to go far when cooking. All-in-all, the feel of the kitchen is one that combines professional functionality and artistic beauty with a warmth that invites visitors to relax and settle in. It was also identical—from the cabinetry and countertops to the flooring and appliances—to the other 25 kitchens in the neighborhood. Bret and his wife, Clarissa, wanted something different, so they enlisted the expertise of Hollie Ruocco, of Creative Kitchen Designs, Inc., and Anchorage contractor Dan Bruzas. One look at the finished product is all it takes to see why the design is this season’s grand prize winner. “Clarissa wanted to focus mostly on gray tones,” says Ruocco,” so we used Steel Gloss thermofoil on the Dura Supreme Alectra Tribeca cabinetry.” Additional texture comes from grain-patterned tile on the floors and stone and glass mosaic tile on the walls. Q-Quartz Carrera Grigio countertops from Alaska Countertops enhance the kitchen’s contemporary feel. “She wanted very sleek and clean lines,” Ruocco adds. Professional grade stainless steel appliances—from the 42-inch Sub Zero refrigerator and 30-inch Thermador range to the Bosch hood and Jen Air trash compactor—were essential. “We wanted appliances that were big, bad and would last while also making our kitchen unique,” says Bret. This is the ideal kitchen for the entertaining household. The homeowners and their kitchen designer, Hollie Ruocco of Creative Kitchen Designs, Inc. spent 18 months developing this masterpiece. The time and attention given to this kitchen are evident in the overall functional scheme, as well as the many small details that you discover when you take a closer look. This kitchen is the centerpiece of a Kenai River retreat, centered on hospitality and sharing life with new friends and old. The hickory cabinets wrap themselves warmly around the stainless steel ovens and range, and fully embrace the Sub Zero refrigerator and freezer hidden underneath matching hickory panels. Granite slabs were handpicked by the owners to provide the natural beauty seen in the countertops, while the polished concrete floors reflect the warm welcome provided by the open concept floorplan. Ruocco enjoyed working with the homeowners to incorporate both their ideas and their own handiwork into the project. The display area on the outward-facing end of the island provides visibility for several prized art pieces. Since the construction site was a two-and-a-half hour drive from Ruocco’s office, perfecting the layout and design prior to installation was crucial. In addition to the kitchen, custom cabinets were designed and installed in several other areas of the home – the dining room, the home office, the laundry room and the mudroom. Ruocco credits the extra time spent with the owners during the planning and design stages for the smooth installation that brought the project to a close. The owners of this kitchen decided to remodel for one simple reason: it was old. That meant having spaces that were tight (8-foot ceiling), closed off (a wall separated the kitchen from the dining room), and just not very functional (a built-in pantry barely held anything). Consider those problems solved and then some. After spending time working with architect Thomas Faulkenberry, contractor J.W. Builders, and Darren Williams at Spenard Builders Supply, the homeowners came up with a plan and saw it through to perfection. A vaulted ceiling opens the room up considerably, and other rooms were altered slightly to add to this open feel. To upgrade and add functionality, they went with Cherry Dewill Mocha cabinets and also created a built-in liquor cabinet and wine cooler. The cabinet’s sliding door is made out of solid cherry to look like a tree, incorporating natural bark on the right and left sides. The cabinet feels both rustic and artistic, a standout piece in the room. The countertops from Mountaintop are quartz, excepting the island, where they installed granite that is two-times standard thickness with a chiseled edge. To complement this decision, Jesse Williams from JW Builders created a gorgeous replica of Van Gogh’s The Starry Night on a 3/4” steel backsplash with metal grinders and Dremel tools that was then patinated, oiled, and sealed with a clear coat for under-the-island seating area. Dark colors were used for a rich, bold feeling, but they still kept it bright with the open layout and through a combination of LED pan lights, stainless steel stair lights (instead of traditional under-the-cabinet lights), and clear glass Edison bulbs. The appliances run the manufacturer gamut (an Electrolux fridge, Miele dishwasher, and Jenn-Air oven, microwave, and cooktop), but they work well together because each has a professional feel. When you put it all together, you get a striking kitchen and a space the owners absolutely love. The original 3-bedroom home was transformed into a duplex with two separate apartments. This kitchen lives in the main unit with a glass wall on one side, taking advantage of natural light and that beautiful view. Additional lighting was added through a skylight and tiny puck lights in a specially designed beam over the counter. Flipping the roof also reversed the home’s layout. Now visitors walk through the kitchen to get to the living room, so the homeowner wanted to ensure the room felt neutral, blending in with the rest of the home. She worked with architect Catherine Call of Blue Sky Studios and Hawkinson Construction to make her vision a reality. In the rebuild, the homeowner used as many green materials as she could source in the Anchorage area. During demolition of the original home, she salvaged what she could for use in the new home or friends’ projects. The room is designed to be a functional workspace and also visually attractive. She chose pieces that felt more like traditional furniture than kitchen items. The pantry is an old piece of furniture. A wood piece was added over the vent, and the fridge was built-in. The homeowner didn’t want granite countertops, and stone wasn’t available, so she got creative, using porcelain floor tile with a neutral wood grain pattern instead. Deciding to forgo overhead cabinets, storage was a concern, but cabinet maker team Wolfgang and Martin Nowka customized the lower cabinets. They repurposed wood from an old table to maintain the older patina while extending them to double the depth. Toekicks were turned into pull-out drawers. But the real highlight is the unifying redwood island. 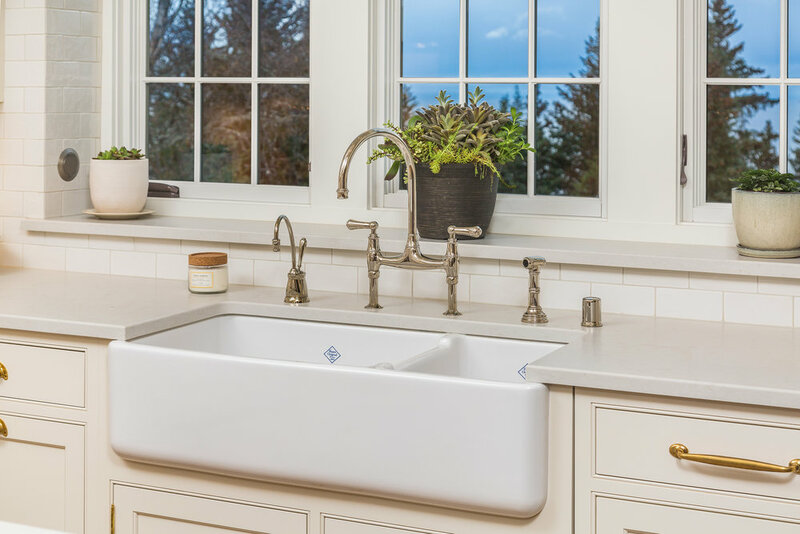 Lighting is provided by two unobtrusive glass lights above, and the round copper sink from Native Trails and copper Sonoma faucet blend in with the natural color and curves of the wood. The appliances include a steamer oven, bake oven, dishwasher, and cooktop from Miele, as well as a second dishwasher from Bosch. The result is a beautiful, seamless space with influences from traditional country kitchens as well as mid-century modern inspirations. We have two options: Print or via the App Store.